This glider is Amish handcrafted in a handsome Mission style and will look great in your living room, bedroom or nursery. 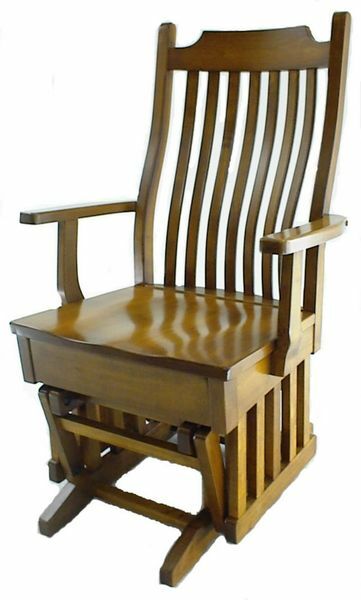 Choose to order this glider in the oak wood or quarter sawn white oak wood with a Michael's Cherry finish which is the traditional option for Mission furniture. You can have the option of having it made in cherry, hard maple, brown maple, hickory or walnut wood. We offer a wide variety of finish options and samples are available to view at our Amish furniture store in Florida or can be mailed to your home or business. Pair this glider with other Mission furniture for your living room, dining room or bedroom. Width at Widest Point: 27 1/2"